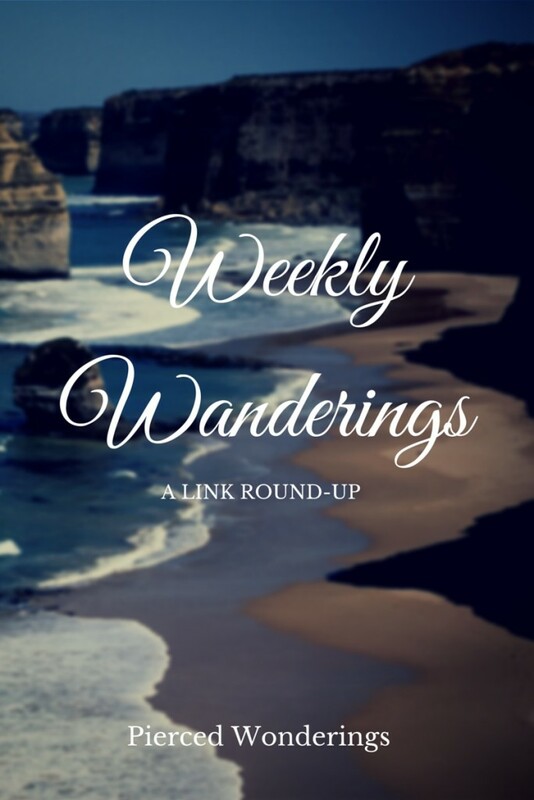 As the blog is getting busier and busier I found I was losing track of what linky parties I had attended and those I hadn't and I definitely had no idea anymore of what post I'd linked to which party. 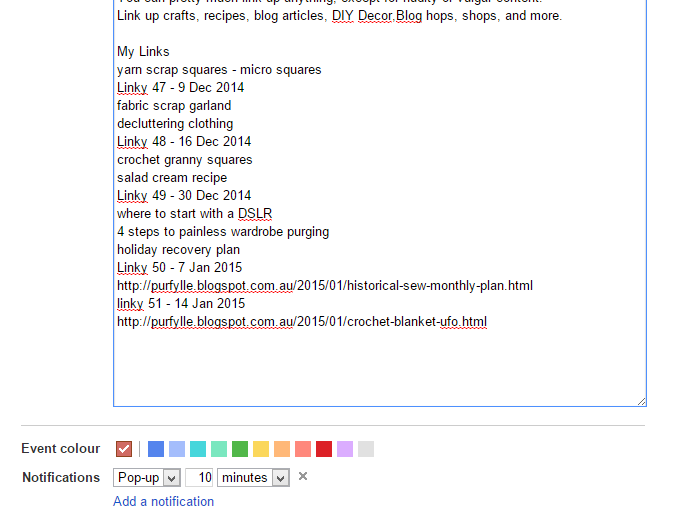 It seems many bloggers use spreadsheets or day planners to keep track of such things. 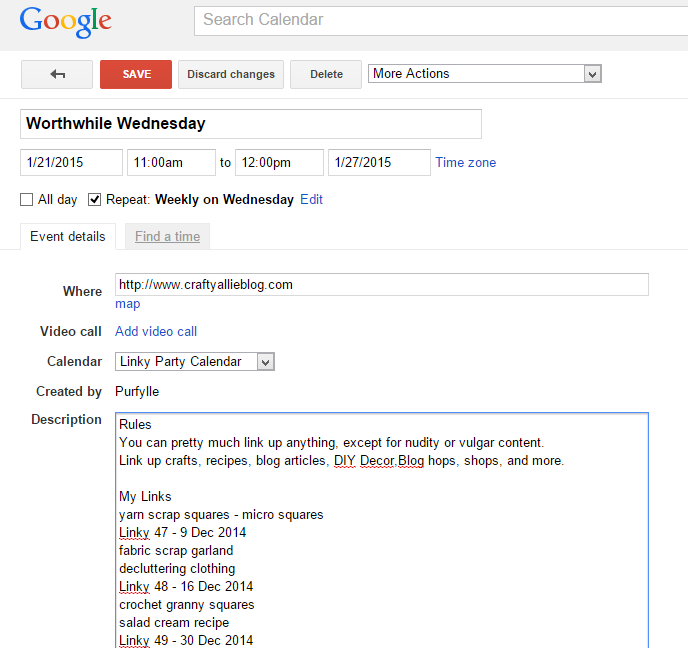 I was relying heavily on email reminders and checking my Linky page to keep up with them. The problem with that is that my time zone is UTC +8 and a lot of parties don't provide their start time in UTC time but in their own local time, if they provide a specific start time at all. I find it's easy to make an error when converting time and so parties that said they started on a Wednesday might actually start on a Thursday for me, but I wouldn't go looking for them on Thursday because they weren't on my Thursday list. I needed to find a solution and I knew a spreadsheet or day planner wasn't going to provide me with everything I wanted. Show me how many parties were scheduled in a day so that I can allocate time for them in my schedule. Provide access to the party information from any of my devices wherever I am. Be easy to maintain, or I won't keep it up-to-date and the whole system just won't work. So you can see I don't want much from a tracker - just everything! Why Do I Want All Of That For My Linky Party Tracker? Knowing when the party starts means I can try to link up as soon as the party begins, but life doesn't always allow for that. Knowing when the party ends means I know if the party is still live and if I can still link up to it if I haven't been able to link up straight away. Knowing the ins and outs of a party is important like how to get to the party and what to bring (link up) before you get there certainly helps to save you time, which will allow you more time to focus on catching up with other party goers. Knowing the rules in advance is also really helpful so that when you're in a hurry you don't have to search for them amongst all the other party information. It's good to be prepared with the right kind of links and the correct amount of links for a party. Knowing I need to link to a pinterest pin rather then a blog post before I get to the party means I won't have to change my plan for what I was going to link up or go looking for a new url to link up. Likewise I don't want to linkup a craft to a recipe party. I don't want to break the rules, even by accident. This is why anything goes parties are my favourite types of party. A lot of parties don't want you to link to something you have linked previously. Now I don't know about you but keeping track of what I've linked up to a specific party for the last 6 months is not something I can just remember. What if your trying to give an old post new life and you forgot that you linked it up 5 months ago at xyz parties but not at abc parties however x & z parties say it's ok to relink stuff you've linked previously, but x says only after 6 months and z says after 2 months. How do you keep track of which of those parties you can link your post to? I want to do the right thing by my party host and observe their requests, so if it starts taking a lot of time for me to manage I'm just not going to attend their party. I need reminders or I get obsorbed in what ever else I'm doing and the party will be forgotten altogether. No paper solution is going to send me a reminder. I want to be able to access the information from my mobile or my tablet and while cloud storage allows you to store spreadsheets they are painful at the best of times let alone on a device with limited screen realestate. I envisage lots of sheets would be needed for each of those parties to track what was linked up when - agggh. Maybe it's just me - I don't like spreadsheets. Databases are far more reliable then a spreadsheet pretending it's a database but having access to it from anywhere is more challenging then a spreadsheet. So neither spreadsheets or an MS Access style database are suitable electronic solutions for what I want, besides I wouldn't consider either as super easy to maintain. 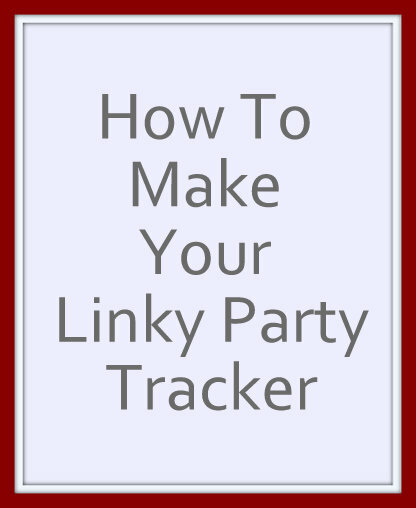 I think your getting the idea by now that there is a bit more to a Linky Party Tracker then you might initially think. Back when I started on my cleaning schedule I set up a google calendar so I could get a realistic idea of how much time I really needed in my day for daily maintenance chores and to get reminders to do them. Google calendars can be accessed from anywhere you have internet access, all you have to do is log into your account, so accessibility wasn't going to be a problem. I thought that perhaps the calendar could work for linky parties too. I just had to think about how it would achieve all the things I wanted from it. I pondered for a while and decided I could make it work. 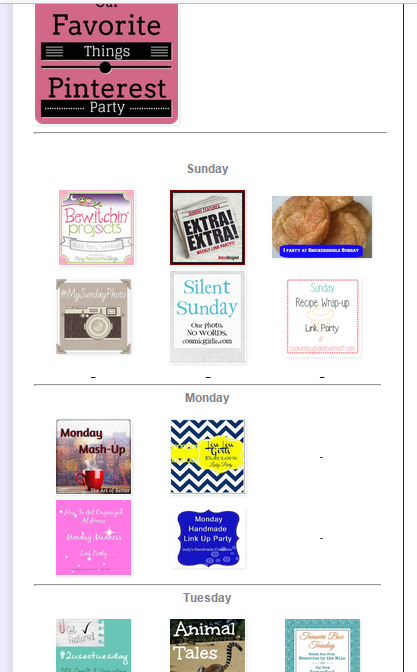 I've created a calendar just for linky parties and I've been adding parties to the calendar as I go. If you would like some help with how Google calendars work and want step by step instructions on how to create a calendar I recommend this tutorial. It takes just a few steps to have all of your party information is in one place. Step 1 - Add A New Calendar Event. I click 'add event' to my linky calendar. I put the name of the party in the event name field. I calculate the start and end times in my own time zones as best I can and adjust them next time if I need to. There is an option to set time zones but anyone who has daylight savings times know how wrong this kind of feature can be so I prefer to just do it manually. Enter the times and dates in the start and end fields. Set the repeat frequency with an end time of never. In the event details section there is a location field, I enter the URL of the party here. Under the guidelines for that party I keep a list of what I've linked up to that party. I type the date and the party number and under that I add the URL or description of my link. I will also make a note if my post was featured. This is an important step because this is what helps me to see at a glance if I have linked to the party or not. I'll explain more about that shortly but for now just allocate a colour ( I use a reddish brown). All of my parties get the same colour. I like to set my party reminders for the start of the party and as a pop up. I only set one reminder but you can set multiple reminders and email notifications too if you like. When you hit save you want to save 'all events'. Every time I attend a party I update my link history and save to all events. This means the whole calendar series now has a record of the links I've just linked up to the party. And that's it. I only have to do steps 1-8 once and then step 9 each time I attend the party and all of my 12 Party Tracking requirements are met. 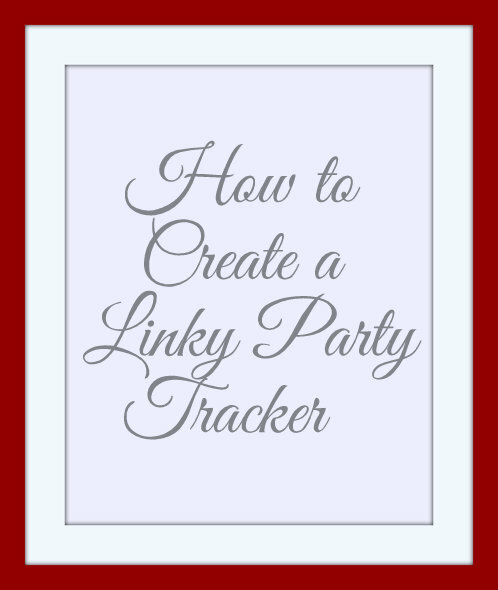 How do you keep track of your linky parties? Hi Stella! WOW, I am so envious of your amazing organization. I use my outlook calendar for all of my 'life' events [appointments, conf calls, birthdays, trips, etc...] but I never thought about using it for link ups. Thanks for sharing at the Monday Mash-Up! I've got Windows 8 now and Outlook just isn't the same anymore. This is a great system! 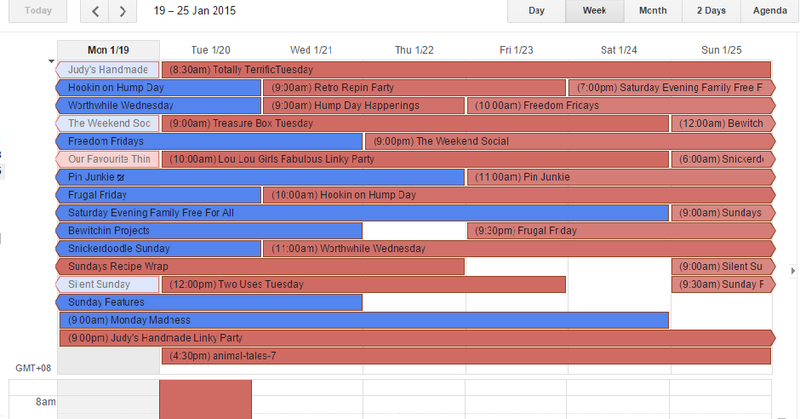 I use a Google spreadsheet to keep track of link parties. It gets nuts sometimes but it makes the work flow fast! I would love if you linked this up to Totally Terrific Tuesday that goes live tonight at 9pm CST! Hope to see you there! I had to go and check what I had linked up! I keep an excel file with the times, but I think mine is so out of date it's crazy. This looks like an amazing idea and just got added to my todo list. I knew that if I did a spreadsheet I would just ignore it. So far this system is working great. Let me know how it goes for you. I just added a party each time I went and that stopped the whole set up from driving me too crazy. Such a great idea! I might even create a whole calendar just for the link parties. I haven't really participated in many, but know that it's a good way to get visitors and comments. Yes, I created a separate calendar for the linkys. I really like how google calendar lets you have multiple calendars and you can view them or turn them off as you please so it's not visually cluttered but you still get the reminders. I find that parties are also a great way for me to find new sites to comment on which gets your blog recognised. Others go ' Hey, I recognise that name, they commented on my site' or 'Hey, I saw a great comment from them on my favourite blog' and it makes them want to click over and see your blog. I use todoist, but I like how you can add what you've linked to the parties in the description. May have to give this a try. I haven't heard of todoist before, I went to take a look but I just couldn't face another create account /password set-up. This is so awesome and a great idea! Thanks for sharing! Clever idea, I just keep all mine on a spreadsheet at the moment, maybe I need an upgrade! Does your spreadsheet work for you? Love your idea! I'm a constant list maker and your idea is terrific. Thanks for sharing! I haven't tried to host a Linky Party yet, but this information can help me do so someday. Thanks! I use my calendar to track the parties I visit. I think I would need to change a few things for hosting my own, but the basic principals would still work I think. I use a spreadsheet, but the google calendar would be able to be used on my phone too. It's great to be able to use any computer and all you have to do is log on. We live in amazing times. Wow. I'm always flying by the seat of my pants, but am starting to get worried about things that will slip through. What an excellent idea. #MondayMadness. I'm already seeing a difference in traffic and how much time linky's take out of my day. I can't begin to tell you how much easier it's made fitting linky's into my schedule. Thanks for linking this up at Totally Terrific Tuesday last week. It is live right now! Can't wait to see what else you have to share! Hope to see you there! My head hurts just thinking about having to maintain all that stuff, I would've given up in the fist week. I hope my colour calendar system makes life easier for you! This is genius. I was trying to make my own last night and kept getting stuck. Thanks for your great ideas! I've had to use excel so much for work, but I really don't like it, if there's another way I'll use it. Nice one - I still rely on pen and paper! I can't trust pen and paper. It would end up buried under a craft somewhere. Oh my goodness, that is very organised indeed! Stella, I think you need to build an app for it! Wow, you are an organized lady. I usually scribble something down on paper, which my preschooler draws all over with marker and cuts into tiny little pieces. It sounds like your preschooler gets to enjoy the parties a lot, I guess that means you get the not so fun job of cleaning up. More than any of these features, I think knowing what I linked up at that party in the past is something I need to know. I am lousy at that and I am sure I have accidentally reshared just because I can't remember. In fact, that is why I have not required that at my own party! 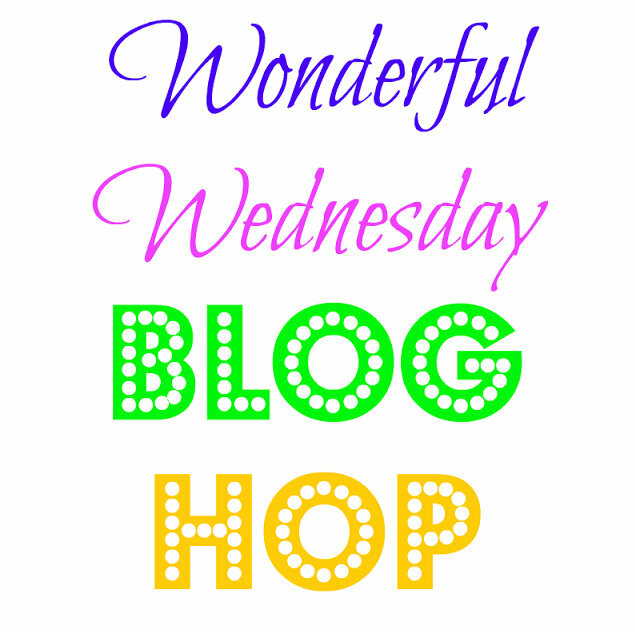 If I can't do it it isn't right to ask others to, Hey, this post was very popular on this week's party and will be FEATURED next week on Wonderful Wednesday Blog Hop! When I first made the tracker I went and checked back a few weeks on some of the parties. At one party I had re-shared the same post 3 times! I was mortified. That hasn't happened since. I love that your party allows reshares. I've actually stopped linking to a party because I was worried about resharing and breaking the rules. Thanks so much for the feature! This is great! I don't link up to very many parties because it's always seemed like too much to keep track of. This would certainly make things easier, though! This system has made linking up to parties so much easier and so much faster too. I've seen the positive effects to my blog as well. Such a good idea! I've just been using a Word document to keep track of parties I attend, the day they start, and what I've posted but this seems like a much more efficient way of tracking all of the important info. Thanks for sharing! Visiting from the Motivational Monday link party. Nearly 6 months later and it's still working great. This looks like a great idea! I know I have too many things slipping through the cracks and it is getting so hard to do link parties "right." Thanks so much for this tool; I have been wracking my brain trying to come up with a good solution! This is still working great for me and I hope it does the job for you too. Now if a party 'slips through the cracks' it's because I've decided something else (like family) were more important and not because I forgot about it. This is such a great idea! I'm going to give this a try...and am picking this for my Feature Pick for Turn it Up Tuesday =) BTW, we'd love for you to join us on our Welcome Home Wednesday Link Party. It's every Wed at 7 am CST. Thanks for sharing this, I needed a way to organize my parties. I am still using this system and it works really well for me. I do have a few updates to add to this post now that it's nearly a year later of using it. It's made keeping track of linkies so much easier. Thank you so much for the feature! It's made such a difference for me. I'm so glad I implemented this system. This is great! I know exactly what you are talking about. I am also in the same time zone (where are you by the way?) in the Philippines. Thanks for linking up for #OMHGWW !! Oh my goodness, you read mind! I have been trying to keep up with what I linked up where and when so this is a great help! Thanks:).